For years I was buried in paperwork and junk that I didn’t need. Every time I tried to deal with it, it stole time away from me. Every time I looked at it, it stole time away from me. It took up space in my home, it made my home feel messy, and it made me feel guilty. Now I have a new way of dealing with every paper that comes into my home – I created a mail center. 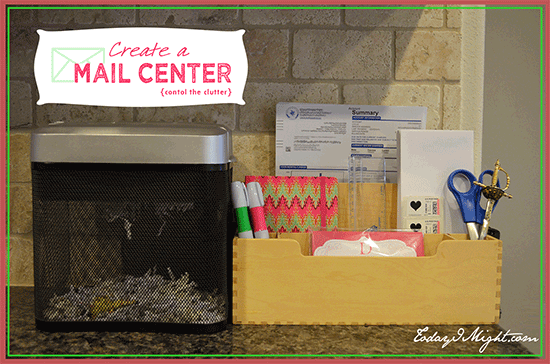 Create a mail center in your home where you can deal with any incoming paper clutter immediately. For me, it’s in the kitchen, right near our front door. 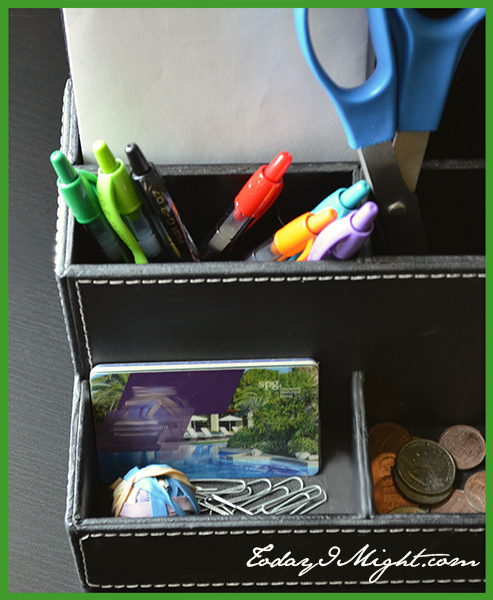 Start with a desk organizer, one that accommodates paper. 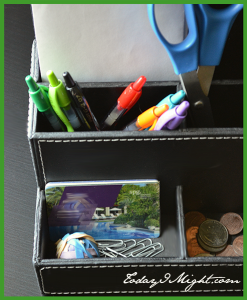 For a modern, industrial look try an Onyx Mesh Desk Organizer , if you prefer a more natural look this Bamboo Desk Organizer might do the trick, or for a traditional look a Faux Leather Organizer could be your best bet. Have a small paper shredder – preferably the cross-cut style. This will allow you to immediately shred any garbage that has personal information on it. Keep in mind that a lot of community recycling programs don’t accept shredded paper though – so only shred the small areas that have personal information and not entire documents or envelopes. If you’re lucky enough to live in a community that does recycle shredded paper, empty your shredder into a paper bag and roll the top of the bag to seal it. Keep essentials at the mail center – pens, letter opener, scissors, stamps, tape, paper clips, elastic bands – basically any items you want to keep handy and centralized. I even have some command hooks on the side of my organizer where I store our keys and work badges. Also, have a notepad, blank cards, envelopes and an assortment of special occasion cards so you can send out a quick thank-you note or birthday card and have all the essentials for outgoing mail easily accessible and ready to go! Recycle any flyers, business postcards, takeout menus and advertising magazines once you’ve cut out any helpful coupons. Throw a notice on your mailbox that you don’t accept unsolicited mail to reduce it. For me, most of my accounts are paid online, and I have opted to go paperless. If I do get a statement in the mail for the odd account, I recycle the envelope it was mailed in and immediately remit payment (if I can) and file the statement. If you’re waiting for a little more money in the bank before sending your payment – and we’ve all been there at some time in our lives – keep the statement front and center in your organizer as a reminder. Once the annual statement for the account is available (if applicable) I shred any of the monthly ones. Seems like personal mail comes few and far between these days, but isn’t it lovely when the monotony of junk mail is broken up by the odd wedding or graduation invitation? For these, I write the pertinent details in my planner and then post them on the fridge both as a practical reminder and as a pick-me-up to remind me that I have a fun upcoming event. Once the event has passed I decide whether to keep the invitation as a memento or recycle it. Be very selective about which ones you keep though – and try to scrapbook or shadowbox it with pictures of the event to elevate it from clutter. Sometimes it’s nice to flip through the glossy catalog of a store you love. But, if you didn’t ask to be on the catalog’s mailing list, nix them. The back cover of most catalogs have instructions on discontinuing them. Usually, they ask you to go online with the catalog code and unsubscribe or reduce the frequency of catalog mailings. You might also consider going paperless and browsing online exclusively. But, if you do decide to keep a few paper catalogs coming your way, once you’ve reviewed them, rip out pages you like and keep them in an ideas scrapbook, vision board, or the like, and recycle the rest. The more consistent and immediate you can be with your paper clutter the more you will have control over it. Think of ways to stop it from even getting to your house in the first place by going paperless or opting out where applicable. We have enough stress and decisions to make in our lives without spending extra time dealing with paper clutter!